Audacity – The best free DAW (Digital Audio Workstation) you've never heard of | VST A Day - One Free VST Every Single Day! Whether on Mac, Linux, or Windows PC; any artist serious about creating sound with computers will at some point want a Digital Audio Workstation. A Digital Audio Workstation puts together a variety of features any musician or sound worker will need, including multi-track mixing, a range of effects, the ability to edit volumes, and the ability to render a mix to a single file. These are just a tiny subset of the features of our favorite free DAW – Audacity. In the next few paragraphs I will go over some of the features of audacity, for those less familiar with the software. 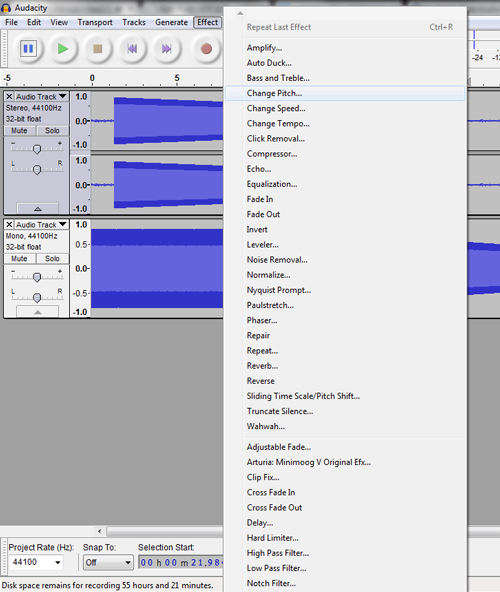 Audacity has a “waveform view” section that allows you to manipulate and mix multiple raw waveforms at once. When creating recorded music, and layered sound effects, it is very important to get the sequencing correct. 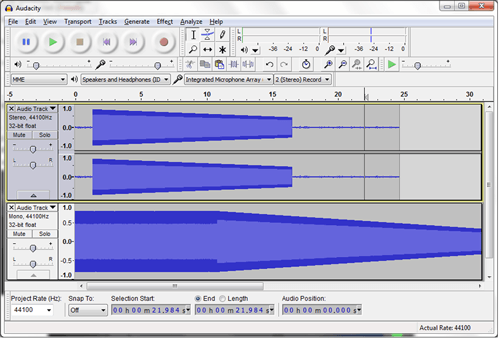 Audacity allows you to highlight, cut and paste between multiple audio tracks. Panning is also available on the right hand side of the display, as well as controls to increase and decrease each tracks volume. Further, the “Envelope tool” allows you to draw amplitude envelopes over each track, in effect automating volume changes in each. Audacity has an impressive list of effects. It even includes its own solutions for effect scripting, and innovative options for plugging in to it. Developers can choose to contribute in C++, Lisp or Nyquist script language, and the versatility leads to a vast array of options available to the end user. The Compressor, Phaser and EQ are competent, to say the least. The Fade In and Fade Out options are very handy and quick to use. “Paulstretch” will allow you to get a very long, ambient sound out of most any track; occasionally this can be cool if one needs a quick ambience. Normalize will normalize your track to a peak volume, pretty standard stuff. Reverse and Phaser are also very musically useful, and can create outlandish extremes, when needed. Also of note are the competent Noise removal and Reverb effects, both of which I have used extensively in the past. 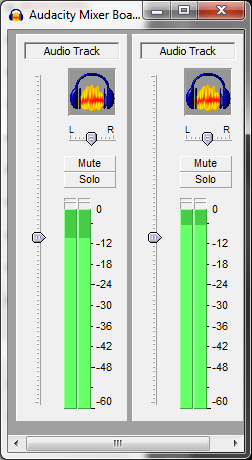 If the built in effects aren’t enough for you, Audacity also hosts VST plugins! 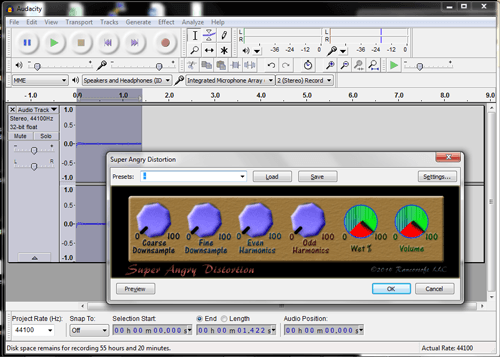 Shown above is Audacity hosting the excellent Super Angry Distortion by Rancorsoft. Super Angry Distortion puts a great bitcrush effect (the best bitcrush in our arsenal), and was a joy to use plugged in to Audacity. 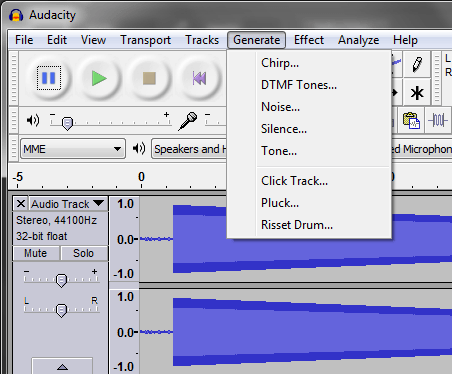 Search through our other articles for dozens of other useful VSTs you can use with Audacity! Often when mixing using a lot of effects, it can be useful to see a Mixer Board. By clicking View->Mixer board from the menu, you get an easy to use mixer board similar to what one might see when using Ableton DAW, Acid DAW, Apple Logic DAW, or similar Digital Audio Workstations. Audacity is OSI Certified Open Source Software! This means, developers and end users are free to view and edit the source code, contribute their own add-ons and mods, and use the software 100% free in any way they see fit. Truly a beautiful thing. One of the coolest features of Audacity is it works as a Portable App. This means you do not need to install it at all – simply download the files, it is ready to use. You can also download the files to a portable drive like a CD or USB disk, and it will work fine on any computer you plug the drive in to! If interested in using audacity in this way, check out the listing on PortableApps.com for more information. If you are anxious to get your hands on the best daw available for free on windows, mac and linux, head over to the official audacity download site (http://audacity.sourceforge.net/download/).